Thread: Super Kingdom Death Explore! So I really like board games with cool minis. Two of the board games that I’ve spent the most time playing are Kingdom Death: Monster and Super Dungeon Explore! 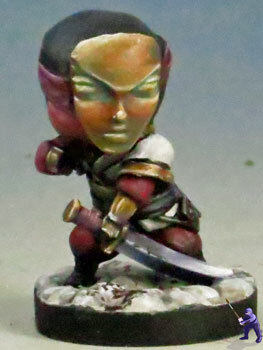 Both are great games with fantastic minis- although the tones each use could hardly be farther apart. The developers of these games know each other, and When both games went to Kickstarter, they took the opportunity to do a cool cross over. So means that we got a really cute chibi of the Twilight Knight. 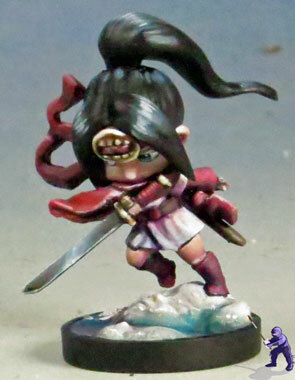 She makes a great mini, and I’d have been happy to leave it off there, but the fluff on her card implies that if those super cute Super Dungeon characters go into the Nether Rift in their seting, they end up in the brutal and bloody hell world of Kingdom Death. So I got to thinking about this, and decided that I really needed to expand on this idea of the cute little chibis on the Planes of Faces. Yes, these are all playable, and I'm going to continue to create Chibi versions of Kingdom Death monsters. And here is the Messenger of Humanity. 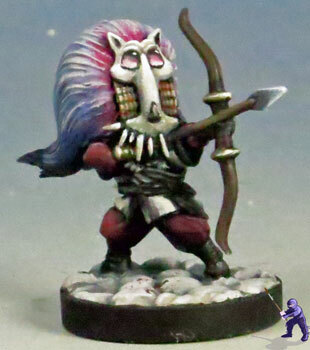 The role of this mini in the game is a little odd. He was part of a set of scenarios that Adam Poots decided weren't working after a beta run. During the 1.5 Kickstarter, one of the promises made is that new rules will be made for all of the messengers. Until then, he's being used to represent a survivor. 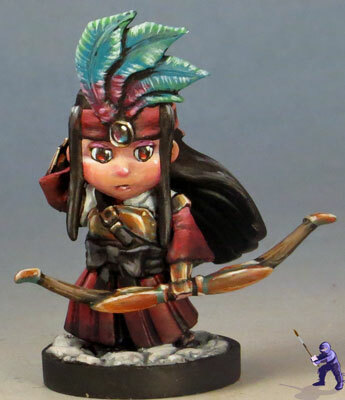 The Sunstalker campaign features the People of the Sun- an alternate group you could start out with that have some nods to Japanese clothing styles and weaponry. 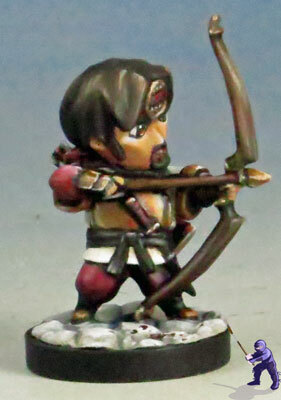 They’re quite distinct from the usual Kingdom Death survivors. 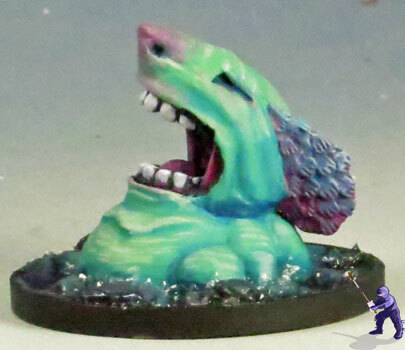 These people live in the shadow of an ancient Sunstalker and raise its young in a pool of colorful liquid. I really love the campaign, and I thought that they would make an interesting subject for some crossover minis. 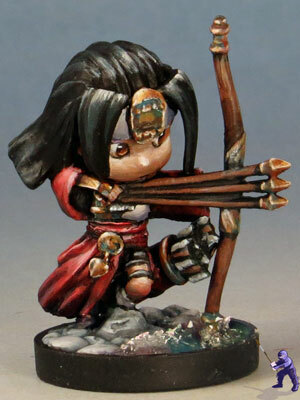 Most of these miniatures started life as a Tanchyo Warband for Super Dungeon Explore. The number of alterations I made to them varies quite a lot- some of them seemed like they would be perfect without any changes, while others needed quite a lot of sculpting and conversion. 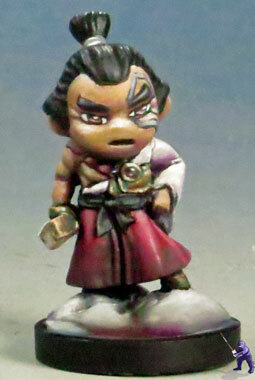 The minis above all work perfectly as Kingdom death survivors, but in order to play this group in either Ninja All Stars or Super Dungeon, they need an Oni. I considered a few different (easier) ways to go about this, but in the end, I couldn't resist sculpting my own infant sunstalker for them!